Great Sub Replaces my Polk 10” The best part of the deal was I found this at my local Goodwill marked $100 but then realized it had an orange sticker and orange stickers were half price so for $50 it was an enormous deal!!!! This sub rocks my basement man cave paired with my Fluance floors and Polk monitors. I just purchase this subwoofer because I wanted to add more bass to mu system. The base of the system includes T+A PA1500 Amplifier and B&W CM4 Loudspeakers. I expected very much from B&W ASW1000, but I am disappointed. It have very very boom sound, a lot of resonance, it produces a unbelievable ear pressure. I have tried everything, both active and passive mode, I tried to move it on almost every spot in my room in order to find right position. Also, I noticed that surroundings on my B&W ASW1000 are very hard on palpation, much much harder than on my B&W ASW1000. I wonder if this could be the problem. Can anybody give a commend regarding this? Does yours B&W ASW1000 have surrounding like mine? Thought I'd throw in a recent comment or two in case someone saw one of these used and was wondering about making the purchase or not. The short of it is that it's a good "traditional" style sub that will play smooth, loud and low enough to work in most small to medium size HT set-ups. It would be a good deal if purchased for less than $200. I own one - which I use in concert with four other powered subs in my main HT. It operates in concert with two Velodyne Servo 1200 subs to handle the bass management signals below 40 Hz from from the "7" speakers in a 7.1 set-up. With careful balancing and the use of a Velo SMS-1 EQ for that three-sub combination, I'm able to achieve flat response from 15-100 Hz. While I've never used the B&W all by itself per se, while leveling and calibrating each sub individually I noticed that it held up well by itself from 25 Hz upwards. For stand-alone high volume ultra low reproduction this is not your sub - especially not in a mid to large room. But otherwise it's quite good. I am using it for Stereo Sound only. I am using a Red Rose Music Passion Integrated Amplifier with the B&W DM600S Bookshelf speakers. I have used alot fo subwoofers before, but so far this one was the best for 2 channel music. It sounds very natural, it hits hard, and is amazing. I only have it at a quarter in volume, and it shakes my room, but it stays very clean at the same time. I would recommend this sub for anyone. Clean, detailed, and articulate. They have spent the money where it counts. Very few if any. A little sensitive to placement to eliminate boominess. I took this on trade for some other equipment not expecting much. I was pleasantly suprised at how well it performs. I have had a number of Subs over the years and the only one that I have kept is the 12 year old M&K MX 5000 that still hasn't been beaten......yet. The B&W is a very nice piece, particularly at used market prices. Clarity, strength, and everything else you want in a subwoofer. Shook the upstairs floor, much yelling from my mom. We know someone who works for B&W, so we can get discounts on anything from them. Out of all of the subwoofers to choose from, and none overpriced with the discounts, our friend, who lives to improve sound quality, recommended this one. The first thing we did with it was watch Saving Private Ryan, and the thing shook the whole house with every grenade. Not only could it get loud enough to do more than please us, but the sound was not raspy or broken up like many other subwoofers I've heard. This was absolutely perfect and clear, and blended really well with the whole system. None, after hearing this I'll never go with anything else. Loud. Very loud. Shakes my apartments like nothing else. Seamles integration to my B&W speakers when set up correctly. Very nice for home theater. Quite difficult to setup, sensitive to positioning and quite big. Have listened to this sub for about 2 to 3 years with my home theater and I am very pleased with it, it's a mighty performer for it's price class. It's not the easiest sub to setup, since it's very sensitive to positioning. I found that the best position in my listening room is at the corner (which is weird..) behind the front speakers. I've been thinking of getting rid of it because sometimes it has felt a little boomy, but all that changed a couple of days ago when I decided to get rid of my old receiver (Onkyo TX-DS575) and got a Pioneer THX certified one to do it's job, now the sub has really started to perform and it blends very well to the overall image produced by B&W 601-S2 front speakers, a CC6-S2 center and DS6-S2 surrounds. Love it. Enough bass to shake out of your chair. Good accuracy for a ported 12" Plenty of power. Can be difficult to control when using some japanese and american amps. I am running this sub off a SONY STRDA50 ES which i find very is a little bass heavy to use with this sub( sub gain on quarter and sub output level set to -10 which is minumum). I find this sub to give out enough bass to shake your house off it's foundations. Like in other reviews room position is critical only a relative small position change can produce drastic changes in tonal accuracy and response. I can recommend this sub for movies but if you are listening to music and you really love tight bass i would probably steer clear of this 12" probably in favour of an 8" or 10". a bit big.... but for those like me who like it... is no deal could do with a slightly larger amp, as is a little slow, with fast paced beats..
price was in australian dollars Firstly, it must be said. specs of the brochures dont really matter. before i bought this beauty, i tested a lot of subwoofers.i am one of those people that believe bass should be felt as well as heard. the test i used for this was obvious. the Jurassic Park scene, when they can feel the T-Rex coming (footsteps in the glass), but you could not see it. this was the first thing i watched. Amazing... i (and my group of friends, who sat amazed) was in heaven. having heard this B&W asw1000, i wanted to wait for the arrival of their new series, 600 and 650. i did wait and listened to them, spending a few hours in the back room of Revolver Hifi store and tested all 3, which he had set up to the same level and giving me a switch to change between them. 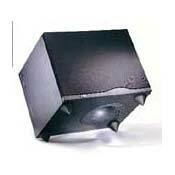 the sealed enclosure 600 and 650 simply did not have the depth of the asw1000. they also seemed to have to try harder to achieve the same result. the 650 was simply a bigger version of the 600 (as expected) the bass ported box of this sub is great, with the golf-ball technology, the new versions could have used too. here i pause, to Emphasize the ROOOM POSITION. i had to spend a few days, to get the effect i wanted. i placed the sub in the middle of a wall, and it sounded flat. to find it satisfactorily, the same scene must be viewed at the sound level, from the same place (best is the seating position) tried all teh positions i could think of, best was in a rear corner, near the seats. was a 15 hour project. although at the end, it was worth it. i have Klipsch SF2 as fronts at moment, a couple of my parents old pioneers (60w) as rears and have a 109cm Sony RPTV, whose 30w speaker is acting as teh centre. this is the next project, the Klipsch RC3-2 and replace the Pioneers with teh SF2 that i have and to buy the RF3-2 as the new fronts. i use the sub 95% movies and hence wanted a sub, with which i could feel all explosions, this was the best i could find. other great movies to FEEL the power: Oceans 11 : the building being blown up Matrix: rescuing Morpheus onwards Commando: hell on the island Hannibal: all through the movie Driven: awesome crash scenes, and the first drive of Stallone with the coins. take the time to place the sub and you will be more then satisfied. a pity it is no longer made. e-mail me for further info or discussion.